The documentary, A Fanatic Heart: Bob Geldof on W.B. 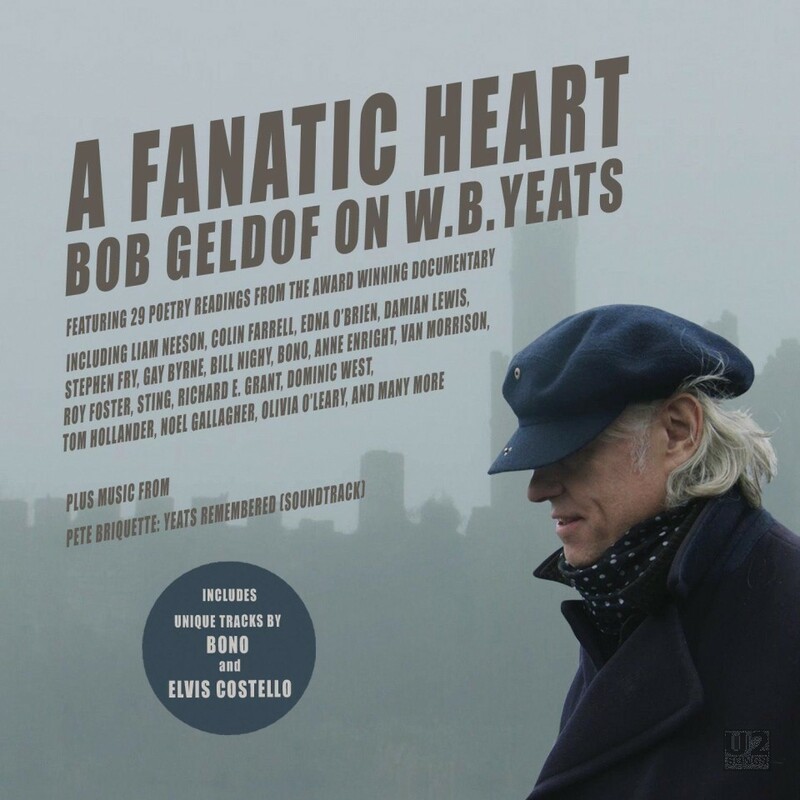 Yeats, is a documentary featuring Bob Geldof, looking at the life of William Butler Yeats, a Nobel prize winning poet. Through the documentary Geldof travels to places where Yeats grew up, where he worked, and where he wrote. The visual exploration of the life of Yeats is accompanied by 73 readings by many well known figures in Ireland, including Bono. Bono contributes to four readings in the film, “Politics” and “He Wishes for the Clothes of Heaven” are limited to the DVD version of this release only. “September 1913” and “On Being Asked for a War Poem” are both featured in the DVD as well as in the accompanying audio release. Other contributors to the readings include Noel Gallagher, Elvis Costelo, Liam Neeson, Colin Farrel, Edna O’Brien and many others. A fifth track features Bono. On the CD, “September 1913 / Mad as the Mist and Snow” is a musical track featuring Bono mostly speaking the early part of the track, and singing the end. This track does not appear in the DVD and is a bonus. A variety of formats are available for this release. A standalone DVD is available in some countries, featuring “Politics”, “He Wishes for the Clothes of Heaven”, “September 1913” and “On Being Asked for a War Poem”. CD and digital audio releases feature “September 1913”, “On Being Asked for a War Poem”, and “September 1913 / Mad as the Mist and Snow”. There are also versions where the DVD is sold packaged with the CD. The documentary debuted on television in two parts on March 24 and 31, 2016 on RTE television in Ireland and April 3, 2016, on BBC television in the UK, and originally tied into the celebration of the 100th anniversary of the Easter 1916 events. The documentary was released on DVD on February 19, 2018. The soundtrack to the film was released a few days earlier on February 9, 2018, as both a standalone CD, as well on digital services such as iTunes, Amazon, and streaming services such as Spotify and Deezer. The poems used in the film featuring Bono were filmed in Dublin in February 2016. Bono attended and read poems in “The Josephine Hart Poetry Hour” at the Abbey Theatre in Dublin on February 21, 2016. His readings for the documentary were recorded during rehearsals for that public reading of Yeats work. It is not known when Bono recorded the song included as a bonus on the CD release. Bono has performed “September 1913” a couple of times at benefits over the years. On December 4, 2003 it was performed in Washington DC with a 24-piece orchestra. And on April 30, 1989 it was performed at a fundraising event with “Mad as the Mist and Snow” at the Abbey Theatre in Dublin. He’s also added bits of “September 1913” to “Love is Blindness” at a number of shows during the Zoo TV 1992 leg in Europe, including shows in London, Birmingham, Dortmund, Kiel, and Sheffield.